3.3 Should you buy one? It's weird to think that there's a high-end power accessory market, but there is. Mophie pretty much dominates it with just a few special characteristics: a slightly more premium build quality, better materials, and high-end specs. Of course, Mophie's products also typically come with a sky-high price tag, and that's the case here with the Powerstation USB-C 3 XL. 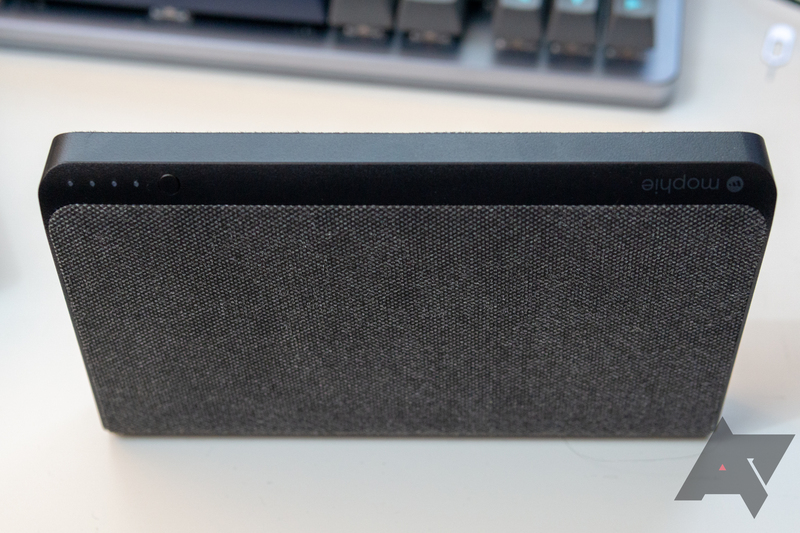 You get 45W of power on both USB-C input and output (with pass-through and different ports for each, too), a voluminous 26,000mAh capacity, and an exorbitant $200 MSRP to go with it. Unfortunately, it refused to work with any Chromebook I tested it with. Output 45W is a lot of power for battery output. Input 45W input is the fastest-charging battery I've tested. Materials I'm not personally a fan, but almost everyone will enjoy the fabric. Design All the ports on the same end. Pass-through Having a dedicated USB-C port for input, together with pass-through, means convenient hotel room charging. Compatibility issues Didn't play nice with Chromebooks in testing. USB Type-A Inconsistencies between synthetic tests and real-life measurements. Price $200 MSRP is nearly three times the cost of comparable batteries. Materials, again Plastic body feels cheap when other expensive batteries use aluminum. 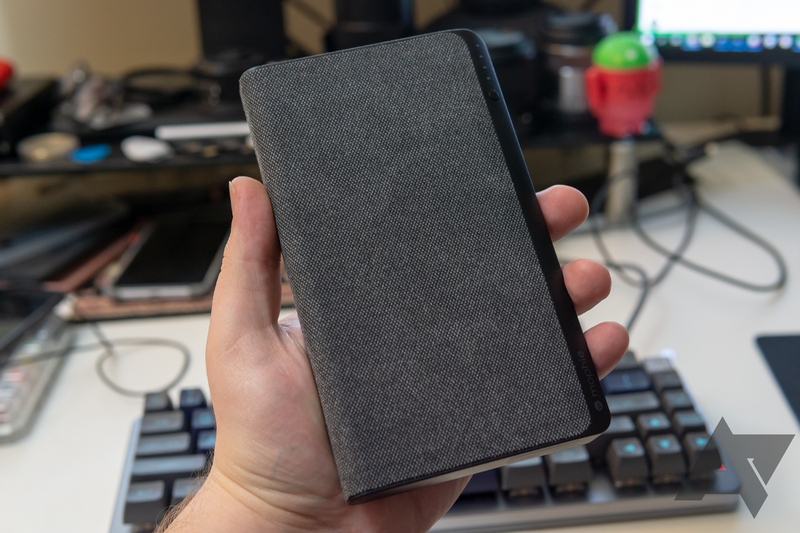 Mophie's Powerstation USB-C 3XL is nearly the same overall shape and design as the larger Mophie Powerstation AC, which we also reviewed. In this case, it's a little bit smaller in every dimension, and without the AC outlet, all of the ports can be placed along the same top edge. There's also a four-LED charge indicator near one edge that is activated by an adjacent button. Like the Powerstation AC, it's swathed in a synthetic fabric taco. It's very smooth to the touch, like close-cropped microfiber. Most people will probably really enjoy it, but I find that type of fabric to feel greasy and sticky (I dislike Alcantara as well if that's any indicator). You get three ports: one input USB type-C, one output USB type-C, and one output USB type-A. Mophie rates these at 45W, 45W, and 12W, respectively, and our testing later on generally confirmed those numbers, with one exception (more on that later). Try not to confuse the two USB-C outlets for one another, as only one is capable of providing output. If you accidentally plug something into the one intended for input and you don't notice that, your laptop or phone could run dry. 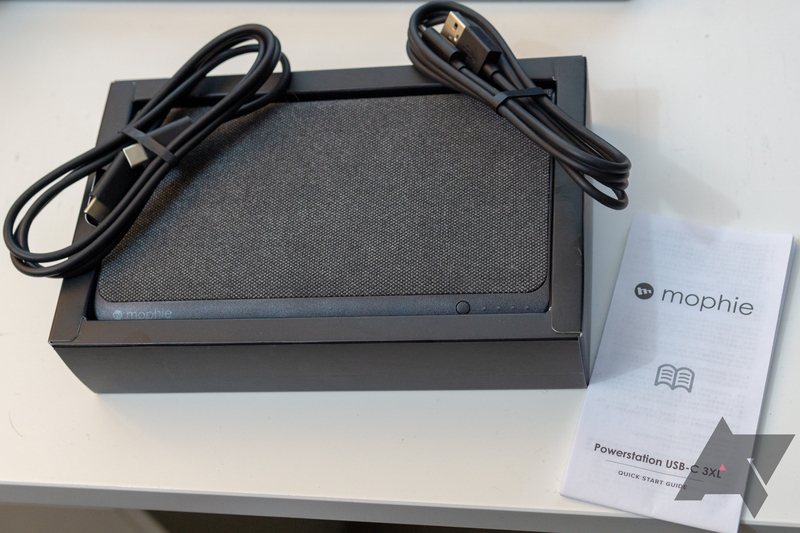 The Powerstation USB-C 3XL comes with the battery itself, two decent quality cables (3' type-C to type-C and 3' type-C to type-A), and a quick-start guide/warranty card. The battery also comes with a 2-year warranty. General measurements of input and output. 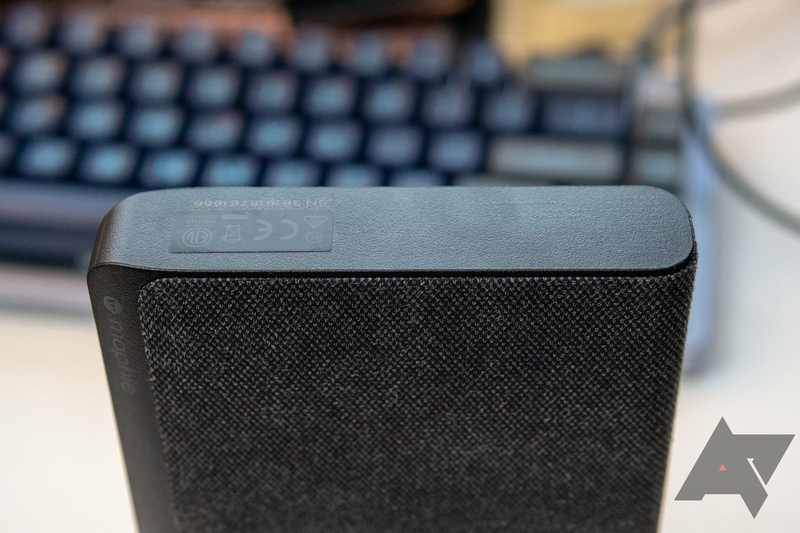 We measured the Powerstation USB-C 3XL in our typical fashion, even testing it with a controlled short to the point of failure to determine both its absolute maximum output, and if it recovers gracefully. This particular battery cried uncle over USB type-A at around 2.85A, cutting power and flashing the LEDs as a warning once that threshold was reached, but it easily recovered mere seconds later. Unfortunately, I don't have my testing suite assembled to measure the same cutoffs over USB type-C just yet. Curiously, although I was able to get 12W of output over USB type-A with my load tester, none of my devices were able to negotiate that rate themselves. Furthermore, none of my Chromebooks — including the Pixelbook and ASUS C101 — were able to charge from the battery either. Since many of our readers are likely to consider higher-output batteries like these specifically for that purpose, consider this a warning. 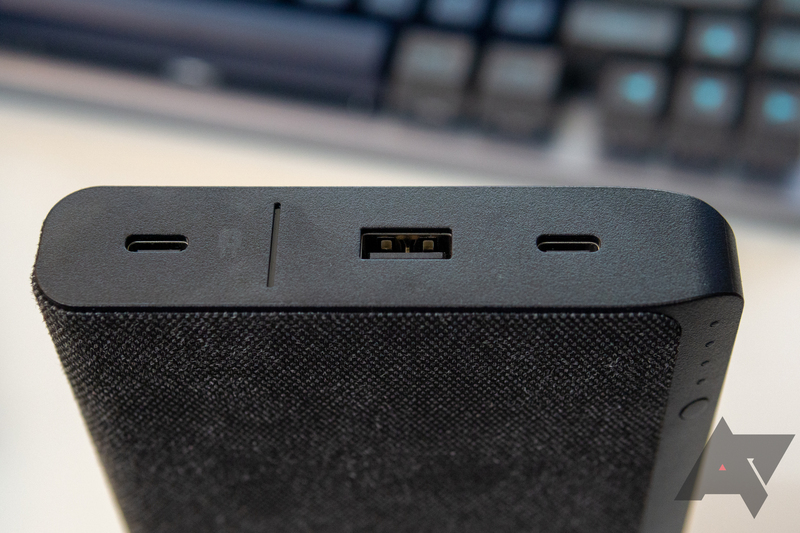 At a hair under 80Wh measured over USB-A, The Powerstation USB-C 3XL seems to be around 80% efficient during discharge — if we assume its 26,000mAh capacity brings it up against the FAA limit of 100W by using ~3.7V batteries. That's well within the expected range of efficiency in our tests, though we have seen higher. Plenty of different variables could be at play, though. No. 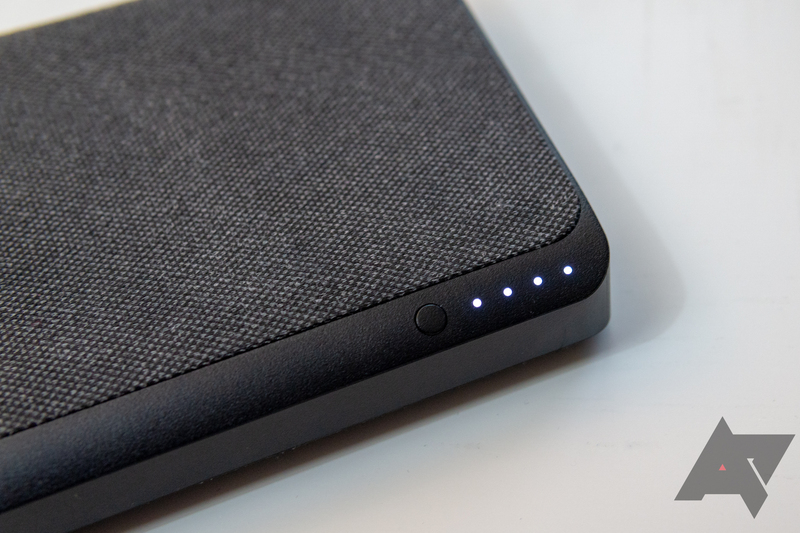 Mophie makes some of the physically nicest power accessories you can get, but you pay a hefty premium for it. You can spend less and get the same level of output elsewhere, and you even trade the plastic for aluminum if you do. However, there is a sacrifice: you lose the simultaneous USB-C charging with USB-C pass-through. Most other batteries aren't going to have the same port configuration you get with the Powerstation USB-C 3XL. Still, you can easily get similar specs for less, and for most of our readers, its apparent Chromebook incompatibility is likely to be a non-starter. 45W of output over USB Type-C, paired with an attractive design and high-quality materials, would seem to make it a perfect companion to Google's similarly premium Pixelbook, but it just doesn't work. 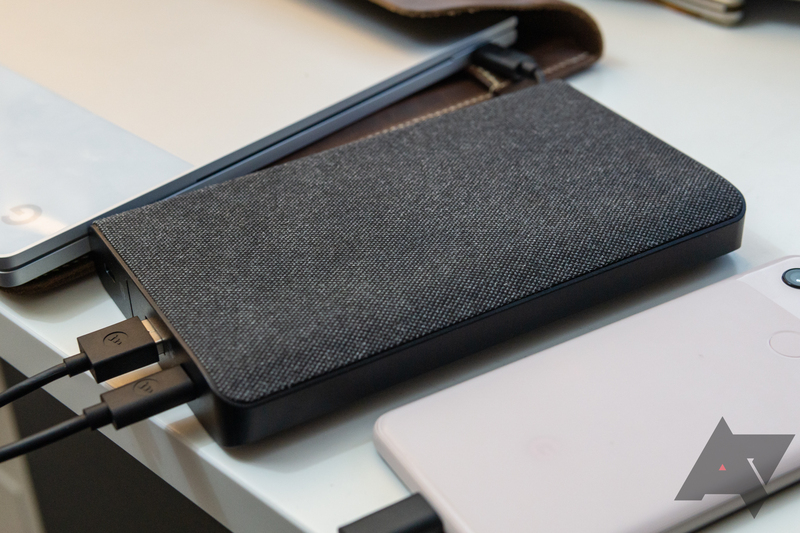 If you use a MacBook, Mophie's Powerstation USB-C 3XL and its 45W of output could be a good, if expensive, choice, but most people would be better served using something else. You've got a MacBook or MacBook Pro. Type-C input with Type-C passthrough is imporant. You have a high budget. You plan to use it with a Chromebook like the Pixelbook. $200 batteries don't factor into your budget. You'd prefer a more durable build quality.